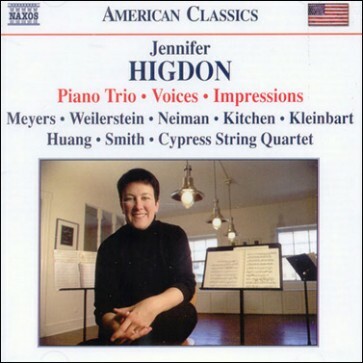 Jennifer Higdon (b. 1962) teaches at Curtis and appears to have emerged as one of the top composers in the field, though this seems to be only her second major record release. Her big Concerto for Orchestra was recorded by Robert Spano on Telarc and generally well received by Mark Lehman (J/A 2004); it won a Grammy, too. 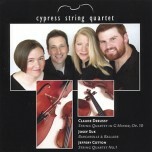 This is her first recorded collection of chamber music, as far as I can tell. Ms Higdon is somewhat aggressively marketed as an "accessible" composer. Not everything here will necessarily fit that description, but I can't imagine anyone not loving the first movement of the Trio (2003), a truly lovely eight-minute slow movement called, for some reason, 'Pale Yellow'. It is cut from the same American romantic cloth as Aaron Jay Kernis's Air-lyrical, sensitive, and even sublime. The fast, more dissonant toccata that follows ('Fiery Red') is playful enough not to offend the sensitive too badly. These are two apparently unrelated movements (or pieces), and the net effect is therefore not as impressive as it should have been. This was unfortunately recorded in concert at a music festival in Vail: sound is not very appealing. The earlier Voices (1993) is a more "experimental" string quartet in three continuous "images". The first, 'Blitz', is a cartoon-music­like exercise in clusters and frenetic, parallel dissonance. II, 'Soft Enlacing', works with Ivesian overlay of vibrating tremolandos, hysterical melody, and glassy harmonics. The finale, 'Grace', opens with plaintive recitative-maybe a precursor to the Trio's first movement-and then leads to more impassioned declamation before its symmetrical return to the opening prayer. The overall effect seems more tentative than both later works on the program. Impressions (2003), also for quartet, is named for the Impressionist movement and its practitioners in painting and music. Ms Higdon is aiming more for commentary on the Ravel and Debussy quartets than outright quotation. The effect is a lengthy, thoughtful homage. One is, of course, forced to think of the originals, which are pretty good and do not suffer by comparison. I ('Bright Palette') proceeds in regular block harmonies, more insistently square than you'll find in the composer's more fluid French models. II ('Quiet Art') has bits of harmonic parallelism and drifts along in aimless blocks of endless melody. III (To The Point') aims for the Ravel scherzo with its opening pizzicato, but its repeating two-bar figures resemble a passacaglia, though the composer says she was going for a Gamelan reference (following Debussy). IV ('Noted Canvas') is cyclical and ends with what amounts to a hoedown. This is a well-crafted piece of chamber music; it might be of value at summer music festivals in programs with the originals, but I'm afraid it has limited value in itself. Naxos is marketing this with their growing catalog of women composers (Gloria Coates, Joan Tower, Margaret Brouwer, and Marion Bauer are listed at the end of the booklet).